Just about the half-way point of the project now, I've finally reached double digits with this day ten entry. As we recover from the Great Minnesota Blizzard of 2010 I think the theme of my next few pieces will be winter, cold, snowy and so on. This man was trying to walk in the street because the sidewalks were just about impassable. At the end of the storm, snow fall totals ranged anywhere from from 16 to 26 inches in the metro area, with blowing and drifting thrown in for good measure. 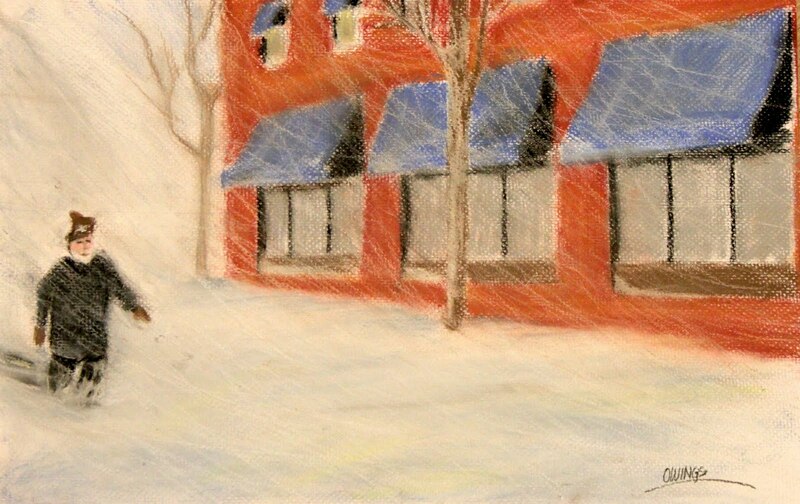 In this pastel drawing, from a photograph I took yesterday, I am just trying to capture the moment. The wind and snow were driving hard. 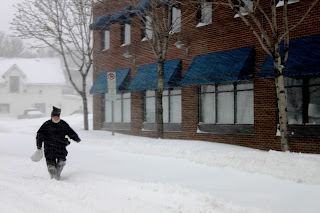 Fortunately for this man the wind was at his back as he made his way wherever he was going. I used Prismacolor Nupastels in four layers. Wow, you have captured the feeling of a windy and cold walk perfectly. Brrrrr! I remember walking in similar MN weather. I can picture this man back home inside, having some hot cocoa as his coat, gloves, and hat hang to dry.